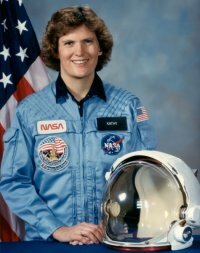 Kathryn Sullivan is the first American woman to walk in space. A veteran of three Space Shuttle flights, Sullivan was a mission specialist on STS-41G (October 1984), STS-31 (April 1990), and STS-45 (March–April 1992). She received a B.S. in Earth sciences from the University of California, Santa Cruz (1973) and a Ph.D. in geology from Dalhousie University in Halifax, Nova Scotia (1978). Sullivan left NASA in August 1992 to become chief scientist at NOAA (National Oceanic and Atmospheric Administration) and is currently president and CEO of Center of Science & Industry, Columbus, Ohio.